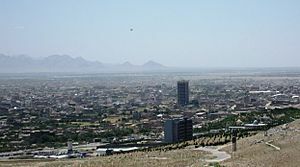 Herat (Persian: هرات, Herāt) is the third largest city of Afghanistan with about 436,300 people living in it as of 2012.436,300 as of 2012. It is the capital of a Herat province. It is in the west of the country, close to the border of Iran. The spoken language in the city is called Herati Perisan or just Herati. Herat Facts for Kids. Kiddle Encyclopedia.